Whispering Oaks Ranch is an excellent place to stay for those traveling with a furry friend. Each of our pet-friendly cabins are in independent locations on the property, providing privacy and easy access to the outdoors. In addition, with 50-acres of open, private property including access to 4 different ponds, there is plenty of area to explore! All pets must be approved by management at the time of reservation. Guests with pets must read and sign our pet policy (emailed with reservation confirmation). A nightly stay fee of $15 +tax per pet is required. Two pets per reservation are permitted. Please note there are different pet policies for Wedding Group Reservations. Guests may inquire for details. 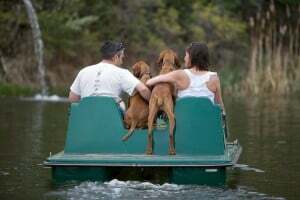 Guests are responsible for their pets on the property, and shall accompany their pet at all times. Pets must be up to date with vaccinations, and well socialized with other animals and people. Please do not allow pets to use sports equipment provided for guest use. There is a Pet Toy Box located near the playground that may have a supply of balls for pet use. Pets are not allowed in the Cedar Bend Lodge. Please be considerate of cabin furnishings. Pets are to be kept off all furniture. In the event of excessive pet hair, dirt or damage, an additional minimum fee of $100 will be deducted from the Guest’s security deposit.